For many DJs, the path starts with a 2-channel mixer. 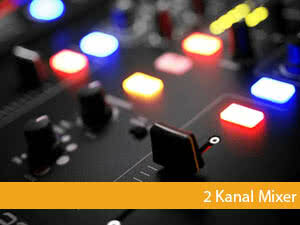 These special DJ mixing consoles have a crossfader in addition to the 2 channels to blend from channel 1 to channel 2. Most of the time there are filters on board and also effects, which are not so extensive compared to the club mixers with 4 channels. A classic battle mixer is small and handy and takes up as little space as possible between the turntables or CD players, since the focus here is mainly on short distances that the hand has to cover. The Crossfader should also be operated as quickly as possible and must be of high quality in order to withstand the stresses and strains. Battle mixers are mostly minimalistically equipped and offer only the bare essentials. This applies to both effects (if any) and connectivity. If the main field of application is classical mixing, e. g. in the electronics sector, high quality effects and good operability are more important. In addition, the later use should be considered twice. Unlike battle mixers,"normal" 2-channel DJ mixers allow you to plug in microphones and other audio sources and offer much more flexibility. 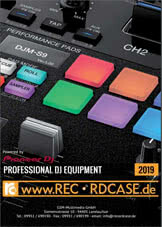 If, for example, they are played later in the club, a larger number of connections, effects and other features makes sense and is also needed more often than short distances and crossfaders. 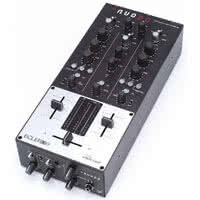 Another design is the so-called DJ rack mixer. These can be placed on a desk or desk next to the audio sources. But they also offer the possibility to be installed in a 19 inch rack and thus highest flexibility in terms of space and application range. This way, even a DJ mixer can be converted to a fixed studio installation. Depending on the manufacturer and model, however, mounting brackets for rack mounting are also available as optional accessories. 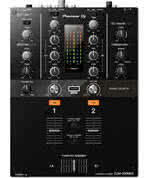 This means that a normal DJ mixer can also be integrated into the studio rack.